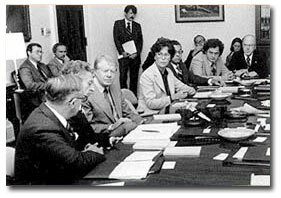 Harry championed the formation of the President’s Commission on World Hunger led by President Jimmy Carter. Harry sits three seats from Carter’s left. 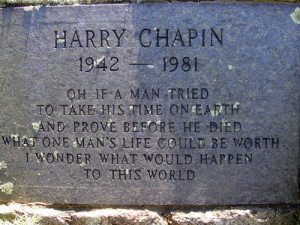 Harry Chapin was born in 1942 into a family of artists in Greenwich Village of New York City. His paternal grandfather, James Chapin, was an important portrait and muralist painter in the mid-20th Century. His maternal grandfather, Kenneth Burke, was a renowned philosopher and literary critic. His father, Jim Chapin, was a well-known jazz drummer who played with Tommy Dorsey and Woody Herman. His uncle, Richard Leacock, was the famed cinema verite filmmaker, for whom Harry worked before making his 1968 Oscar nominated film Legendary Champions. And Oscar, Grammy, Peabody, Emmy and Tony nominations and awards. He communicated with his audience on a very personal level. He put the listeners inside the experience to reveal the inner feelings and sensitivities of the lonely, alienated, indifferent, frustrated and fearful who find small certainties and quiet victories. His music fans will always remember him for his hits Taxi, WOLD, Cat’s In the Cradle, Sequel and hundreds of other songs. But one of Harry’s last musical achievements was the stage musical Cotton Patch Gospel, based on the book The Cotton Patch Version of Matthew and John by Georgia preacher/activist Clarence Jordan. The musical re-tells the gospel of Matthew as if Jesus were born in the 1930s in Gainesville, Georgia. 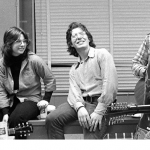 Rolling Stone writer Dave Marsh called the combination of spiritual, gospel & bluegrass “some of the best songs Harry Chapin ever wrote.” The musical production has been staged in regional theaters, colleges and churches all over the United States and is as relevant today as when Harry wrote it. Others will remember Harry for co-founding WhyHunger (formerly World Hunger Year). 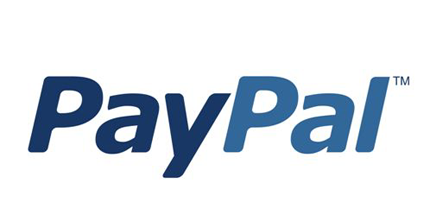 Or founding Long Island Cares, the Harry Chapin Food Bank or supporting dozens of other organizations and causes. By 1979 when Harry completed his contract with Elektra Records and signed with Boardwalk Records, his songs in the album, Sequel were reflective as in Story of A Life. Our nation’s attempt to save the world for democracy left us struggling to save what was left of our national pride and purpose. The deaths of Harry’s activist heroes — John Lennon and Allard Lowenstein — propelled his remembrance of them in the song Remember When The Music. Harry’s last album, The Last Protest Singer, had him looking at a renewed, individualized social conscience and was intended to be a film score for a composite protest singer like Woody Guthrie. The album was a tribute to folk singer/activist Pete Seeger and other heroes whom Harry admired and tried to emulate, and to those who had been compelled even in the face of failure and fear, to stand up and be counted. Congress remembered Harry by posthumously awarding him the Congressional Gold Medal—the highest honor bestowed by Congress.